Office Space - Market Harborough, Leicestershire. 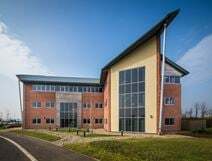 Conveniently located in Market Harborough, in an area which benefits from excellent transport links and has direct access to the motorway network, this brand new business centre consists of offices of various size. Fully furnished and provided with a full range of services and facilities, these offices offer a highly professional working environment ideal for companies and entrepreneurs.